The female film critic: an endangered species? The waning powers of the female film critic? When I think of the people who first turned me onto talking and thinking about film, the list skews heavily female: Pauline Kael. Amy Taubin. Molly Haskell. I even liked Libby Gelman-Waxner, who wrote the satiric column “If You Ask Me” for Premiere Magazine and, who by the way, was actually a nom de drag: comedic writer Paul Rudnick doing his best impersonation of a Manhattan housewife/career woman. I’m not sure why this was the case. Maybe I liked women writers because I was a woman who wanted to be a writer! As a film school student, maybe I just preferred “serious” critics. Most of these women, judged by either the length of their reviews or by their actual academic bona fides, seemed awfully serious to me. Or maybe - and don’t crucify me Chicagoans - I just liked New Yorkers. But I started rethinking my connection to film criticism after reading some depressing news. A two-month survey conducted this past spring, of the movie aggregator site Rotten Tomatoes, found that 78 percent of their “top critics” were men. And those dudes accounted for 82% of the site’s total film criticism. Talk about the man snake eating its man snake tail! For now, some have complicated Lauzen’s bottom line, including the great Linda Holmes at NPR. But to me, Lauzen’s findings really resonate. I still read lots of female film critics, from Manola Dargis to Farran Nehme. Great as they are, they’re still few and far between. And when I look for women critics in Chicago, the picture only gets worse. Take your pick: the Chicago Reader, the Tribune, the Sun Times, TimeOut Chicago, Gapers Block, Windy City Times, WBEZ’s Filmspotting? Most of these oulets’ film critics – and certainly the “top critics” – are men. Or take a look at the Chicago Film Critics Assocation, whose membership is mostly male. Then recently, two national outlets with local ties upped the gender inequity ante. Pitchfork announced it’s new film site The Dissolve. Among the seven critics (most formerly of the A.V. Club), two are women: Tasha Robinson and Genevieve Koski. Meanwhile, over at RogerEbert.com, newly appointed editor Matt Zoller Seitz is not only a man, he’s a New Yorker! Seitz has certainly built some fine film criticism outlets, including Press Play. But if the contributors there are any indication, Seitz has mainly mentored men: Out of 41 writers, 8 are women. Lest I sound like a cranky and slightly obsessed accountant, toting up gender counts at various media outlets, I want to stress that there are of course women here writing about film: Nina Metz and Maureen Hart at the Trib, Ruth Ratney and Carrie Kaufman at Reel Chicago, and many more at CINE-FILE.info including Christy LeMaster, Candace Wirt, Chloe McLaren among others. Of course, any attempt at a list is most defined by what’s left off it, so if I’ve missed any local female film critics, please don’t yell, just add their names in the comments section below. Meanwhile, ponder this interesting silver lining: While women may not have achieved critical mass in local or national critical circles, they are a significant presence among film programmers and presenters. In fact, as I started to compile this list, I was astonished by how many local film series and festivals are due in whole or part to women. Another interesting fact: many of these women got into programming by starting as filmmakers or projectionists, and many of them are still working the booth at various local cinemas. Here then, is as comprehensive a list as I can muster, with some musings from local programmers about why women seem to gravitate toward programming over criticism, and why the lack of female critics matters. One thing to note as you review this list, and add other names below, there is almost no diversity among local female programmers - most on this list are white. 1. Film Houses. Barbara Scharres, Programmer, Gene Siskel Film Center. Scharres started out by making films, then was hired as a projectionist by Siskel founder Camille Cook. After a stint as technical director she moved into programming. Scharres says that based on an annual gathering of North American film programmers, the male-female split is about 50-50. On the surface that makes the programming field more female friendly than criticism. Scharres notes that women who present films tend to have more formal film educations or academic backgrounds, whereas much current criticism tends to favor “Quentin Tarantino-types”: Young, strongly opinionated male film fans who undergo a thorough and self-driven film education. Scharres says maybe the people who hire film critics might be less disposed to a lack of female critics who don’t come off as “brash, enthusiastic fanboys.” But she thinks their absence means we are missing something. As an example, she cites the recent film at Cannes, François Ozon’s “Young and Beautiful”, a movie about a rich young woman’s random turn to prostitution. Scharres noticed a clear gender divide in the critical responses, saying it left most women saying “what the f*&k get out of here,” while men seemed to find it “so real, so beautiful, so plausible”. Scharres does write about film - she is one of the critics who covers Cannes for RogerEbert.com. Though I noticed that the site’s recap of the festival followed the usual two dudes talking format. Others: Mimi Brody at Northwestern University’s Block Cinema. Julia Gibbs and Sabrina Craig at the Film Studies Center and Haley Markbreiter of student-run Doc Films, both located at the University of Chicago. 2. Multi-taskers. Christy LeMaster runs micro-cinema The Nightingale, previously contributed to CINE-FILE.info and for a time was a film critic for WBEZ&apos;s Eight Forty-Eight. Like many others I spoke with, she got into programming because she’d rather show a film then tell someone about it. Though CINE-FILE includes a number of women critics, LeMaster says there’s been lots of debate among contributors about the absence of film voices in local film criticism, and perceived sexism in some reviews by men. But what most struck here was the “weird culture” of Doc, which involved a fairly regular group of guys debating films and showing off for one another. Friends, and more. Together with Kyle Westphal and Julian Antos, Hall founded the nonprofit Northwest Chicago Film Society, which emerged out of the ashes of the former Saturday night screenings at the Bank of America cinema and had, until its recent and abrupt closure, done a weekly series at the Portage Theatre. Like LeMaster, Hall was most interested in creating a space where “we put on a show and people come to see it.” But her path there has been less through programming and more via administration and business building. That&apos;s been the case for others as well. Hall told me Linda Stagner runs the business end of the Silent Film Festival, which is programmed by Stagner’s husband Dennis Wolkowicz. Others: Amy Beste programs the annual experimental media series Conversations at the Edge for the School of the Art Institute. Anne Wells and Nancy Watrous run the Chicago Film Archives, and regularly presents free film programming throughout the city (full disclosure, I’m a member of the CFA’s advisory board). Lyra Hill, a projectionist and filmmaker, runs Brain Frame, a performative comix event which includes a strong film component. Meanwhile Manual Cinema, which does shadow puppetry with “cinematic motifs” includes Julia Miller and Sarah Fornace among its members. 3. 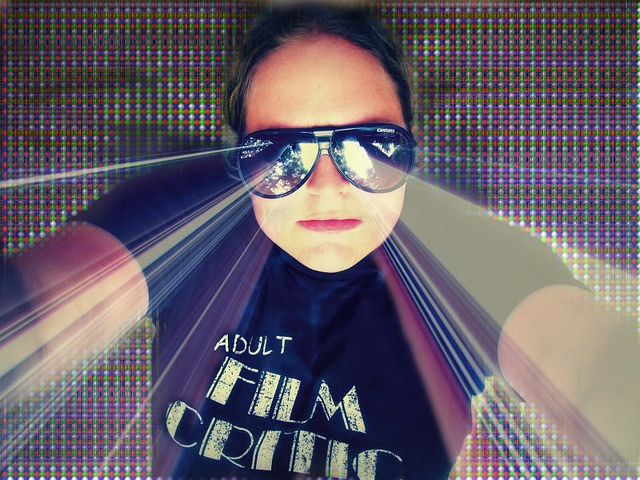 Film Festivals Lori Felker makes films, projects at the Siskel, and coordinates the Chicago Underground Film Festival. Mimi Plauché has been Programming Director at the Chicago International Film Festival since 2006. Noha El Shareif is the Executive Director of the Chicago Palestinian Film Festival. That’s all I’ve got for now. Again, please add your favorite female film critics/programmers below. And let me know - does the lack of female film critics matter to you? Why or why not?